Hellboy is a half-demon from hell that’s so full of charisma that even the United Nations says he’s an “honorary human.” The only thing damned about him is how damn likeable he is! Created by writer-artist Mike Mignola, Anung Un Rama (Hellboy’s true name) was summoned to earth by the Nazis, but good fortune shined on him and he ended up in the hands of the Professor that founded the Bureau for Paranormal Research and Defense, who took him in and raised him. Professor Trevor Bruttenholm loved him and treated him like a normal boy. He grew up learning to fight the dark forces of the world and eventually became the so-called “World’s Greatest Paranormal Investigator” working for the B.P.R.D. Now that you’re all caught up on Hellboy’s origin story, get ready to see him back in theaters early next year. The next cinematic installment will star David Harbour, and though Ron Perlman will be missed, the casting choice has been met with almost unanimous applause. 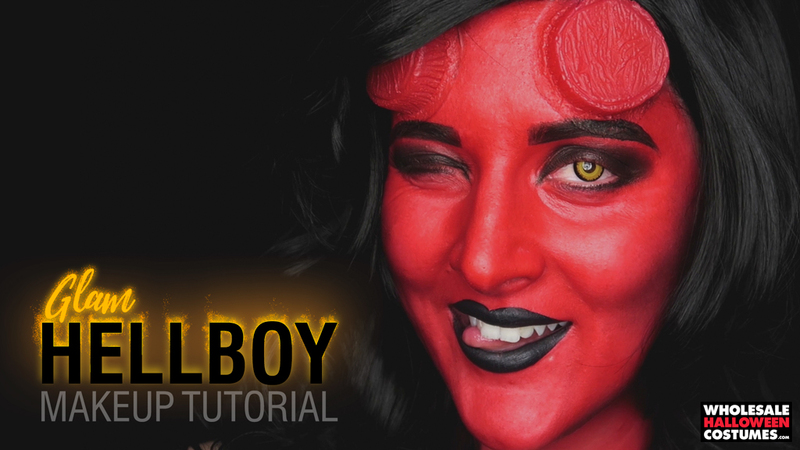 Take your Hellboy costume to the next level with this makeup look to appear just like Red- well, with a sultry femme twist! Watch the video to see Caitlyn Kreklewich turn up the heat on this hellish look with a touch of glam! If you’re digging this video go subscribe to her channel! First cover your hair with a wig cap. 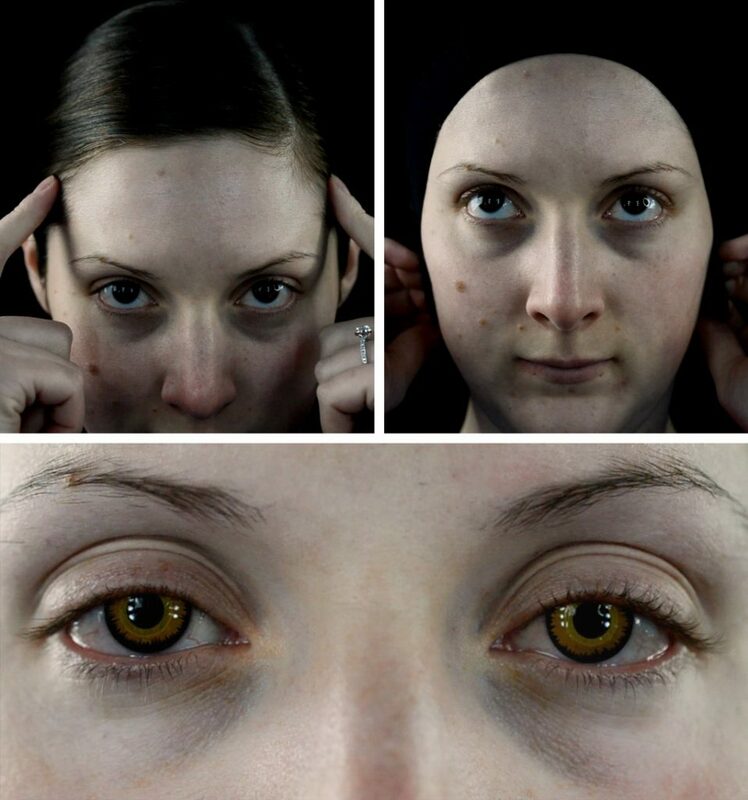 And pop in some yellow contacts if you have them! 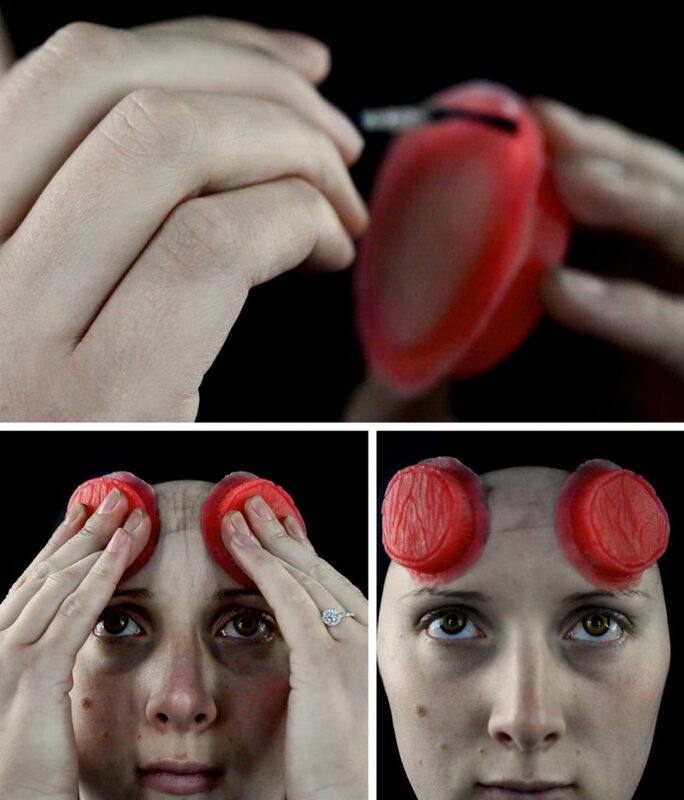 Use the skin safe adhesive of your choice to apply Hellboy’s signature sawed-off demon horns. Caitlyn used spirit gum. Hold the prosthetic against the skin until the horns are firmly attached. 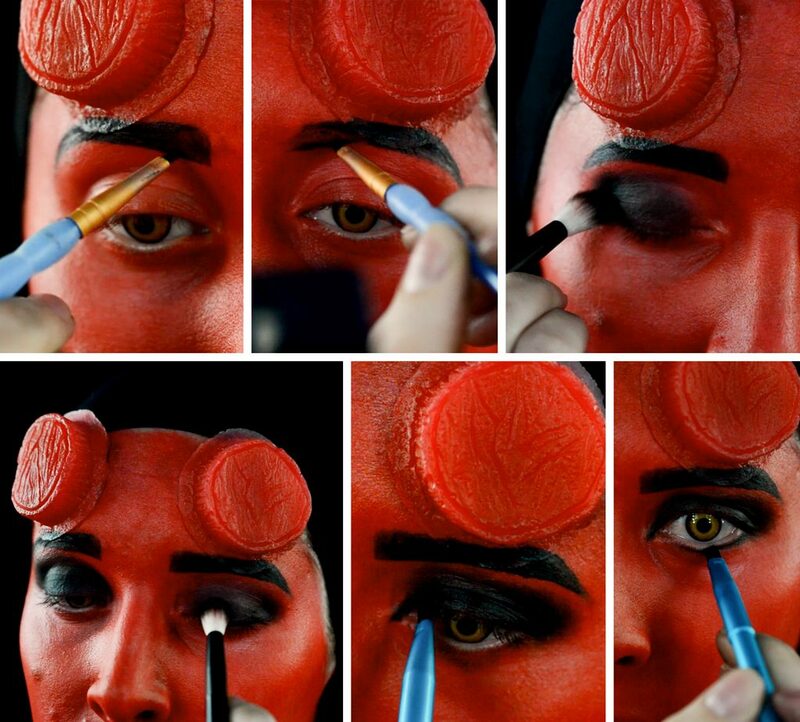 Extra Tip: If you want to smooth the edges of the horns into the skin even further, brush on a layer of liquid latex along the edges and onto the skin and allow to dry. Repeat that process until the edges are no longer obvious. Powder over any latex before applying makeup. 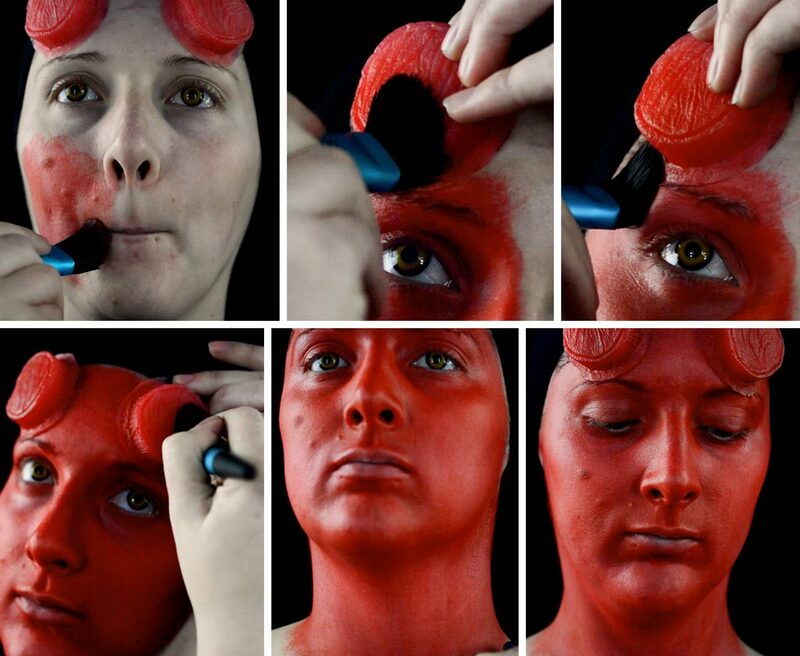 Start covering the entire face and neck with red makeup. You will need a few layers for full coverage- it’s worth the extra time for a flawless look. Don’t skip the horns! Make sure to cover them with red makeup too. Time to add some bold black brows. Pick a shape that works for your face. This look obviously gets a very smoky eye. Blend it out well. Give a little downward flick to the inner corner of the upper lash line. Line the lower lash line with black- tapering the line toward the nose. Paint on a big pouty lip in pure black. Time to contour. Use a big fluffy brush to sweep on black shadow under the cheek bones. Blend it out very well. 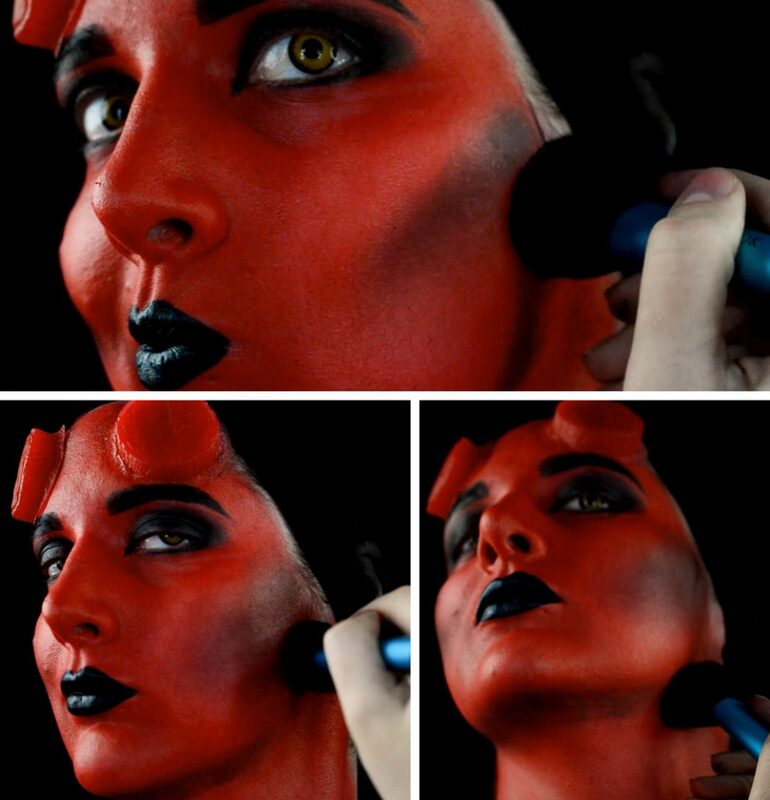 Add contour under the jaw bone as well and blend like heck. Pop on a jet black wig and all you need is a trench coat, holster, cigar and the right hand of doom! Save this on Pinterest! You’ll need it when the Movie comes out on January 11, 2019!